Dubai, UAE, March 27, 2018: The first TAG Heuer chronograph to bear the prestigious 'Tête de Vipère' stamp of excellence, awarded by the Besançon Observatory. Since 2006, only 500 watches have received this highly exclusive certification. A brand new limited edition of 155 pieces released to celebrate 55 years since 'the Heuer Carrera was created. The 'Tête de Vipère' stamp was applied to a chronometer for the first time by the Besançon Observatory in 1897. This high-quality metrological guarantee is a mark of the unrivalled precision and excellence of a watch. Abandoned in the 1970s, then relaunched in 2006, the 'Tête de Vipère' stamp has since been awarded to just 500 pieces. To obtain this certificate of excellence, each fully assembled watch undergoes a protocol involving 16 days of testing, in five different positions at three different temperatures. TAG Heuer is therefore today unveiling a new, highly modern version of its TAG Heuer Carrera Chronograph Tourbillon Chronometer with a contemporary design and featuring two of traditional watchmaking's most famous complications: a tourbillon and a chronograph. 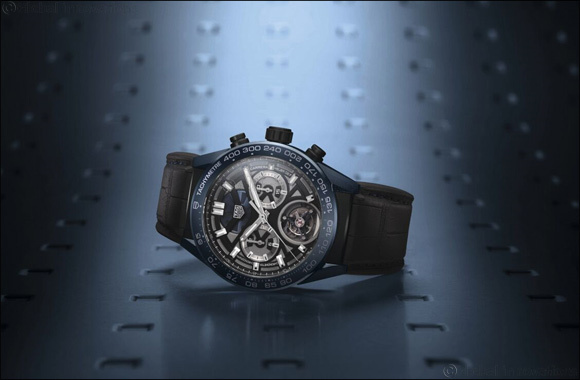 The movement is housed in a magnificent midnight blue ceramic case, complemented by a ceramic bezel and lugs. Elegant touches of blue can also been seen on the weight and movement barrel. With its polished, brushed and bead-blasted finishes, the result is a sophisticated, modern piece, reflecting the highest quality Swiss watchmaking technology. The 'Tête de Vipère' stamp has been applied to the bridge, visible through the sapphire crystal of the case back. Advanced technology, high quality, high performance and exceptional manufacture expertise, combined with perfect mastery of industrial processes and production costs, make the TAG Heuer Carrera 'Tête de Vipère' Chronograph Tourbillon Chronometer a perfect addition to the brand's range, enriching the design codes and DNA of TAG Heuer, Avant-Garde since 1860.